Inside NeNe Leakes Nobu DC Restaurant Diva Meltdown! NeNe Leakes is putting a popular DC eatery on blast for poor service and AllAboutTheTEA.com has the inside scoop! The Real Housewives of Atlanta star is currently on tour with “Girls Nite Out Comedy Show” and during their stop in the DMV area, NeNe paid Nobu in Washington D.C. on Saturday night, a visit but her dining experience was not satisfactory and the comedian took to social media to blast the establishment. “DMV this manager right here at NOBU @nobudc Is and was horrible to us!” NeNe started her post. She then explained that the manager exacerbated the issue instead of fixing the problem and shared a photo of the man. 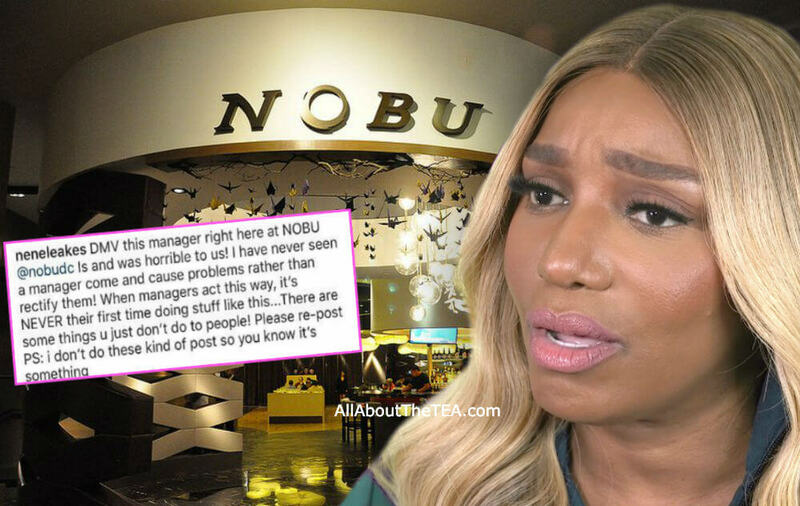 Many of NeNe’s followers responded to her post with support but a Nobu DC employee reached out to AllAboutTheTEA.com to share inside details on the incident — claiming NeNe and her girls threw a diva fit because they did not get their way. Nobu is the worlds most recognized Japanese restaurant, known for its innovative new style cuisine paired with a hip crowd and celebrity following. DMV local and Real Housewives of Potomac star, Gizelle Bryant, offered her support and said she will no longer patronage the restaurant. But NeNe has since deleted her post slamming the famous restaurant. Who do you believe? NeNe Leakes or Nobu DC’s version of events? Sound off in the comments!